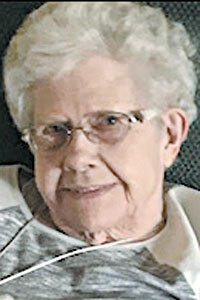 Eveleth Sylvia Heckathorn, 93, of Fostoria, passed away Monday, Aug. 6, 2018, at Good Shepherd Home, Fostoria. She was born Aug. 1, 1925, in Pelican Rapids, Minnesota, to Elmer and Anna (Mo’en) Sleen. She married Charles E. Heckathorn Jan. 17, 1947, and he died in 2005. Surviving are five children, Karen (Richard Johnson) Miller, Craig (Helen) Heckathorn, Karla (Tom) Grine, Kevin Heckathorn and Kirk Heckathorn, all of Fostoria; a sister, Joyce Piepho of Colorado Springs, Colorado; a brother, Robert (Dorean) Sleen of Waseca, Minnesota; 10 grandchildren, Kelly (Mike) Stevens, Shannon (Melinda) Miller, Chad (Jayne) Heckathorn, Adam (Abby Bomer) Grine and Ashlee (Tyler) Day, all of Fostoria, Andy (Melanie) Rumschlag of New York, Abby (Jason) Smith of Fostoria, Sean (Courtney) Heckathorn of Texas, and Kylie Heckathorn and Kirk Heckathorn Jr. of Old Fort; 17 great-grandchildren; and six great-great-grandchildren. Eveleth was preceded by her husband, Charles; parents; a sister, Laverne Haarstick; a son-in-law, Charles Miller; and her angel granddaughter. Eveleth retired from Seneca Wire and was a member of Hope Lutheran Church, both in Fostoria. Visitation will take place 10 a.m.-noon prior to services Thursday, Aug. 9, 2018, at Hope Lutheran Church, Fostoria. Her funeral will begin at noon Thursday at the church, with the Rev. Dr. Larry Knigga officiating. Burial will take place in Knollcrest Cemetery, Arcadia. Memorials can be made to Hope Lutheran Church or Bridge Hospice. Harrold-Floriana Funeral Home, Fostoria, is assisting the family with arrangements.